Oh my God... I've never seen or heard of fake meat seafood but it sounds horrifying. Does it smell shrimpy and oceanic? Shrimpy/fishy, yes. Oceanic? No. It's very weird. I found on another website that these are not vegan- the protein source includes whey protein. I can't wait to try these things out, I miss seafood since going vegetarian! Meg - thanks for settling that! Good luck finding them! Been a vegetarian for about 18 years, but was kinda scared to try these. Finally did so today (product found at a Safeway in Maryland)--was happy w/choice. Had about five with a good cocktail sauce and have been thinking about them ever since. I tried these in the microwave...terrible! Super tough, and made the house smell like bad fish. I've been hooked on these since I found them last month. As a veggie for almost 30yrs, I've only vague memories of seafood from my teens, but my omnivore husband agrees that they taste great. The main ingredient is glucomannon , fiber from the konjac root, which is often marketed for weight loss and cholesterol lowering, so the nutrition content looks like this (per box): 100 cal, 3g fat, (2g sat/0 trans), 0 chol, 480mg sodium, 16g carbs, 4g protein and 10grams of fiber, so they're essentially roughage! Regarding the previous post, I'm not sure why anyone would microwave these on their first go-round, as that's usually the least tasty way to go w/meat subs, so if Jeff wants to give them a 2nd try, I suggest trying my route: saute them in a little bit of sesame oil, and throw in some seasonings, asian noodles & veggies. Another added bonus: no mud vein! Thank you Ms. Negative. you managed to prep us all with your horribly negative build only to top the story with a negative cherry on top. Amazing how the negativity just flows from beginning to end. Good job. Actually, I did say that in the skillet, these came out pretty good - it was just the other cooking methods that I found to be terrible, hence the B+. I'm glad you tried them anyway, despite my criticisms, and that you liked them. There is an ingredient called Cordlan listed on the package. Any clue what that might be? I think they are FABULOUS! I THOUGHT they were Vegan, though. I didn't see Whey protein as an ingredient on my box. So..I will research further. Anyway...I melted a bit of Earth Balance in the skillet with garlic and salt. Put the shrimp in, cut in two pieces. Browned a bit....put some green peas in there and then basmati (brown) rice. YUMMMMMMMMMMMMMM!!!! The shrimp even fooled MY CAT!!! That is his ALL TIME FAVORITE FOOD EVER!! He munched away, too. There is sauce that came with my shrimp (labelled "shrimp scampi"). It was hideous and I am glad I tasted it first. The only complaint here is that it is a VERY small amount and a VERY HUGE PRICE. I wait until they go on sale at my local Kroger Supermarket. Then, I buy away and freeze them. LOVE!!!!!!!!!!!!!!!!!!!!!!! Vegetarian for forty years, I too was skeptical. Bought one box at Grocery Outlet for .99...yes ninety-nine cents and tried first "raw", then sauteed in olive and sesame oil, the latter being pretty good dunked in Thai chili sauce. Tempura fried will be next, since I've decided to back to G/O and buy the lot for the freezer. I'm not vegetarian, but I ordered "vegetarian shrimp and asparagus" from my local Chinese place and was surprised to see that a real effort had been made to make them shrimpy. They're not bad, but I think of them as more like "vegetarian fake crab" (my head exploded!) 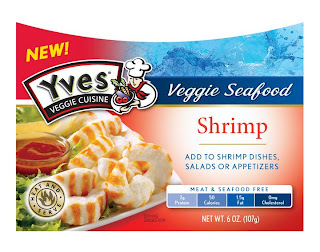 than "vegetarian shrimp." They taste a bit more fake crabby to me. I tried these veggie shrimp oncce. While visiting in Albany. Georgia, I found them in Publix grocery store. I brought some back to Ca. with me, and my husband loved them. They are NOT fish. But they have a texture and taste of their own. Great in salads, with shrimp sauce as an appetizer, in a stir fry. My problem is, there is none around here, even if the store sells Yves products. The Yves web site does not even show them. Question is, where can I buy more??? I would even purchase on line, if you can tell me where to find them? shrimp was what i missed most when i went vegetarian. just tried my first pack of these, cooked them in olive oil with some garlic, pepper and lime juice.. they came out great! they matched really well with fettucini alfredo with broccoli and spinach. ate one raw, just to taste, didnt have any cocktail sauce, but the texture and the seafood-y aroma were nice, like to try dipping them, and maybe at a colder temp than refrigeration.. I think the best way to do this is to prepare them like you would real shrimp. I put them in a buttermilk wash and dredged them in Old Bay Seasoned flour for the breading. Then we deep fried the hell out of them! My boyfriend is 100% vegetarian and he found them disturbing that it tasted like real shrimp. We both found them incredibly tasty after we double checked the ingredients to make sure there was no real shrimp in them.